Sheds are useful storage spaces and can be built in a variety of ways. Check building codes and residential regulations first; some jurisdictions have restrictions and rules on the types of sheds, foundations and other factors. The size and purpose of a shed also will affect the type of foundation and flooring; bigger sheds for heavier implements and materials will require stronger foundations. Gravel is a basic component of many foundations. Use gravel as a base to hold concrete piers or wooden skids for a shed or set a platform floor directly on a properly built bed of gravel. Many shed plans or instruction sets begin with making a base of gravel, which is compacted firmly to hold pre-cast concrete piers to support floor joists or wood skids that will hold a platform floor. Some shed kits use platform floors that sit directly on a base of gravel. A gravel base requires preparation. 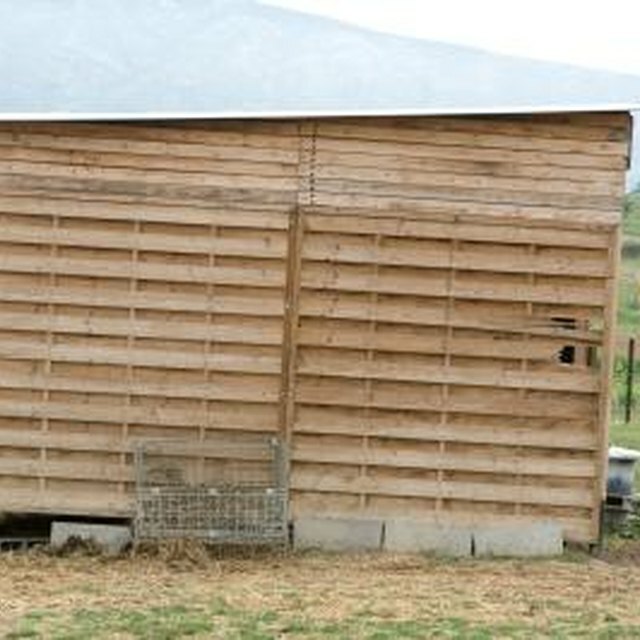 The shed area must be outlined with stakes and builder's twine and squared with diagonal measurements to make 90 degree corners. The depth of excavation depends on the size and weight of the shed, but at least 4 inches of medium gravel (about 1/2-inch in diameter) is often required. Placing landscape fabric or black plastic under the gravel will prevent weeds and grass from growing under the shed. It also will block moisture from coming up into wood set on the gravel. Spread this barrier to cover the entire area, stake it at the corners to secure it and spread the gravel over it. Use material heavy enough that any sharp edges on the gravel won't poke holes in it when the gravel is compacted. Solidify the gravel with a hand or mechanical tamper. Compact it until it is almost a solid surface; it still will have small openings to allow water to drain away. Use a board across the gravel with a level to make the surface level for skids or beams rest on it. This will require adjusting gravel by hand; you can sometimes speed the process by putting a plywood panel over the gravel and tamping it down. Always use pressure-treated lumber or similar material for skids or beams on gravel. No matter how good the drainage, a gravel base will have some moisture that can cause untreated wood to rot. Adjust drainage around the gravel base so ground slopes away from the shed area, at least 1 inch in 10 feet, so any rain or other water will run away from the shed and not build up in the gravel.